Even in this day and age of alloys, composites and plastics many properties require the TLC of skilled and dedicated carpenters. There are numerous instances where a skilled woodworker would be needed to adjust, fix, repair or replace exterior and interior woodwork, trims, furniture, staircases, banisters etc. In light of this, we offer our private and business customers across London a professional carpentry service at very reasonable prices. Large scale woodwork projects – staircases, banisters, front and back doors, windows, fences, framing, exterior features like pergolas, decking, outdoor furniture etc. Smaller jobs like laying skirting boards, fixing of sticky doors/windows, creaky floor boards etc. 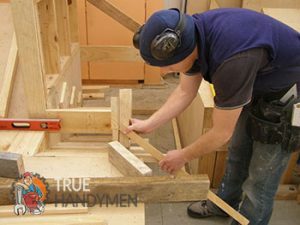 Our carpentry service in London is carried out by teams of qualified professional carpenters with sufficient experience (and the right set of skills) in different types of woodworking. The guys approach each project with the due attention and precision in order to meet customer requirements in full without allowing for any errors or delays in completion. If customers are faced with an extensive woodwork restoration project, or they require professional finishing touches we can combine carpentry and painting in one service. Fitting and maintaining hardwood flooring properly is complex and specific task which must be handled by qualified professional carpenters. Our teams are very effective in installation of all types of hardwood flooring. Furthermore, the guys can perform repair and replacement of floorboards, large sections of flooring, or the entire hardwood floor altogether. Keep in mind we can follow up with restoration and final touches of any hardwood flooring. If you got a custom made kitchen, wardrobe or staircase in mind then perhaps our professional carpenters can make your vision a sturdy reality, all the way down to the final touches. Our carpenters can work with you every step of the way and assist with design, functionality, lay out etc. of your furniture and features. The guys will also help with choosing the right kind of timber given your requirements and preferences. Our skilled and experienced carpenters can also deal with larger exterior projects like construction/repair of pergolas, decking and fences, also repair and/or construction of wooden benches and other outdoor furniture. Construction of wooden frame structures (decorative or other) is also within our scope of expertise. We offer individual pricing, based on the scale and complexity of the project at hand. Woodwork specialists can visit you in advance to discuss your requirements and assist with choice of timber, design, functionality, layout etc.